Send visible elements of a 3D View to the assets folder of a Unity Project. 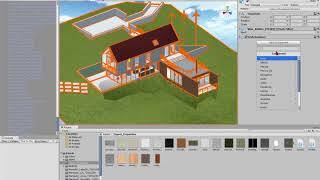 The tool will generate OBJ, MTL and image files format that can be read by Unity. Other VR and modeling software like Unreal Engine or Blender can also read these types of files. All meshes from the 3D view will be parsed and exported to .obj files according to vertices number. 3 grouping options are available: By Materials, By Entities or One Single Object. "Export to Unity" will work only with Revit version 2018.1 or higher. Image angles from textures are not supported for now. When a Revit material includes a rotated image, the equivalent material in Unity will reset the angle to 0. Exported Obj files are very small and can not be opened in the Unity. Why? It’s probably a bug related to materials, it has been fixed in the new version. It&#8217;s probably a bug related to materials, it has been fixed in the new version. It's great! I will import model to Unity very easiest! One of the best and useful add-ins for Revit.